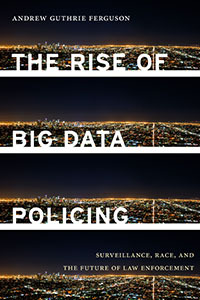 Join the Tech Policy Lab for a book talk on The Rise of Big Data Policing: Surveillance, Race, and the Future of Law Enforcement by Andrew Guthrie Ferguson. The Rise of Big Data Policing introduces cutting-edge technology that is changing how the police do their jobs and shows why it is more important than ever that citizens understand the far-reaching consequences of big data surveillance as a law enforcement tool. Andrew Guthrie Ferguson reveals how these new technologies—viewed as race-neutral and objective—have been eagerly adopted by police departments hoping to distance themselves from claims of racial bias and unconstitutional practices. But behind the data are real people, and difficult questions remain about racial discrimination and the potential to distort constitutional protections. Andrew Guthrie Ferguson is Professor of Law at the University of the District of Columbia’s David A. Clarke School of Law. Professor Ferguson is a national expert on predictive policing, big data surveillance, and the Fourth Amendment. He is the author of Why Jury Duty Matters (NYU Press, 2012).